Eckart Exhibit by Idea International, Inc.
Eckart started as a small goldbeating shop in Fürth, Germany over 139 years ago and is now represented in more than 70 countries as a division of the ALTANA Group. Eckart is an international manufacturer of metallic, pearlescent and special effect pigments. 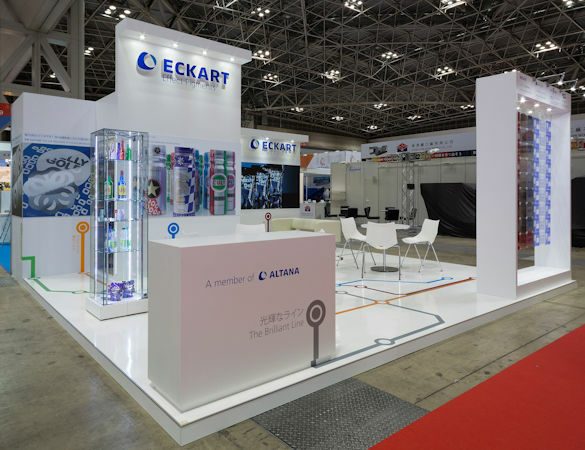 Because the company serves a world-wide market, the International Graphic Arts Show (IGAS), showcasing the latest products, technology, and services related to printing, paper converting, and digital graphics, helped Eckart build business in the APAC region. This clean white 6m x 6m exhibit with casual seating is the perfect backdrop for Eckart’s pigments.